Uniquely organized, Asset Management Insights follows the life cycle of industrial assets and infrastructures. Indeed, one of the fundamental points of the definition of asset management is its management perspective covering the entire life cycle of assets rather than specific segments such as maintenance. This new book reviews the thematic components of asset management both from a conceptual point of view (originality, approaches, methods, tools) and from the point of view of its practical application (conditions to be met, recurrent difficulties, and organizational constraints). Most other titles on asset management tend to describe the practice and related ISO standards in a rather clinical manner. In contrast, this work focuses on concrete situations experienced by those who have implemented the concepts, discusses how, and when, and WHY they failed, and how they adapted their practices in order to succeed. 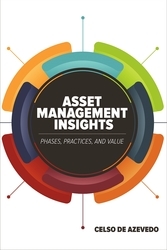 Packed with stories from professionals and companies that highlight aspects of different functions, tools and elements of asset management from a variety of different industries, including infrastructure (water, energy, transportation), public service (post offices, hospitals), manufacturers, public, and private companies. Guides readers to explore the essential actions to be undertaken, and the major pitfalls to avoid. Organized in parts and chapters that address individual topics of asset management according to the sequence of life cycle segments of any asset belonging to an infrastructure or industry. This allows the reader to follow asset-related questions throughout their lives or to choose to study specific life segments (chapters).